You must be a competent swimmer, have a good level of fitness and a head for heights. Ideally you will have been coasteering before. You MUST have been coasteering with us before so that we know your ability before we take you on a more adventurous coasteering adventure. Coasteering is run between Easter and the end of September. 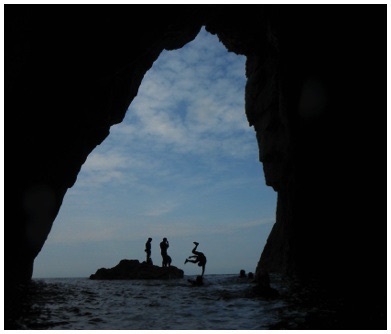 If the sea state (swell) is too rough for coasteering, Sea Level Traversing can often be run as an alternative or Gorge Scrambling is sometimes offered. Coasteering is an exciting journey along the coastline down at sea level. It involves scrambling along the cliffs, swimming in the sea, and jumping off rocks into the sea. ADVENTURE coasteering involves visiting some of the more serious and commiting cliffs of Anglesey. You will find yourself in stunning scenery, often having done a commiting abseil to access the bottom of the cliff. Rock climbing and swimming are used as a way to discover the coastline. Some big sea caves and rifts can be explored.